Metrodata's LVM2000 enables the transmission of LAN frames over a serial connection, e.g. operating with satellite modems offering LVDS interfaces, and thereby providing a low cost alternative to HSSI for operation at up to 52Mbps. The LVM2000 is a member of the MetroCONNECT family, offering Managed local Ethernet Switching at up to 1Gbps and LAN extension over LVDS Serial wide area links. 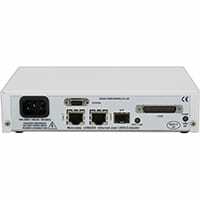 The LVM2000 supports auto negotiation and auto MDI/MDI-X cross-over switching on two RJ45 LAN interfaces. A further LAN interface is provided via an SFP port, offering either an additional RJ45 connection or a variety of multi-mode and single-mode fibre interface options. The LVM2000 will also operate with the latest generation of high speed crypto units which offer LVDS interfaces for operation at up to 52Mbps. The LVM2000 offers an automatic transmit crypto resync function that will generate a resync request to the crypto if the LVM2000 senses the data stream has lost synchronisation. Ethernet VLANs are supported, either by pass-through of existing Tags or by the Push and Pop of Tags on ingress and egress at Ethernet ports. Pre-embedded prioritisation schemes can be honoured, or alternatively prioritisation can be over- written under Management control. Bandwidth limitation per port and per prioritisation can be implemented, providing a mechanism for differentiated QoS for multiple services. Management is offered via each of; Serial Terminal connection, Telnet, SNMP or Web Browser application. Management security is offered via SSH and TACACS+ authentication. Support is also offered for ‘Carrier Ethernet’ Link OAM Management (IEEE802.3ah), enabling status information to be shared with connected equipment if required. Management is offered using OAM, SNMP or Telnet, either locally via any of the available subscriber ports or remotely over a WAN connection. With VLAN support enabled, management access is enabled individually on a per port basis to provide secure access to the unit. The LVM2000 supports VLAN in two ways. In normal mode, VLAN tagged frames are passed unmodified; however when VLAN support is enabled, the LVM2000 supports VLAN tag-based switching whereby access may be controlled using VLAN IDs. The unit is password protected for Telnet access for security, and for SNMP is configured with a primary and multiple back-up NMS stations. SNMP access will only be accepted from an authorised NMS. This application shows how the LVM2000 can be used to deliver LAN over LVDS satellite modems. This application shows how the LVM2000 can be used to deliver LAN over LVDS satellite modems via an LVDS encrypter, such as the KIV-7M. The LVM2000 supports an auto crypto resync function which will automatically detect a loss of encrypter synchronisation and resync the encrypters. This application shows how the LVM2000 and BC1000 can be used to deliver Ethernet over HSSI satellite modems via an LVDS encrypter, such as the KIV-7M. The LVM2000 supports an auto crypto resync function which will automatically detect a loss of encrypter synchronisation and resync the encrypters. This same network topology can also be used with radio relays systems.